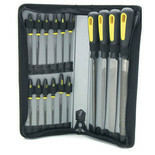 Sixteen piece tool set consisting of four 200mm files and twelve 140mm needle files for shaping metal parts and components. 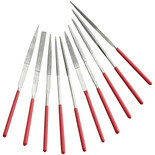 Full set consists of four 200mm files and twelve 140mm needle files. 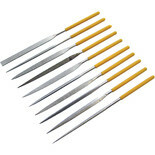 A ergonomically designed high carbon steel 8"/200mm Half Round Flat File, featuring a comfortable soft grip handle ideal for prolonged use. 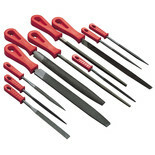 Manufactured for use with most metals. 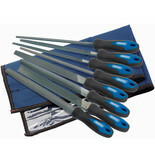 A ergonomically designed high carbon steel 8"/200mm Flat file, featuring an ergonomic, comfortable to use soft grip handle. 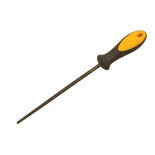 Manufactured for use with most metals. 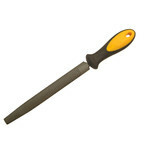 A ergonomically designed high carbon steel 8"/200mm Round file, featuring an ergonomic, comfortable to use soft grip handle. 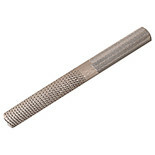 Manufactured for use with most metals. 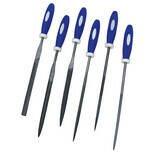 This 10 piece set includes a flat, 2 x flat pointed, half round, square pointed, oval, 2 x triangular and 2 round files. 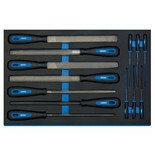 This set is completed in a handy case for secure storage. 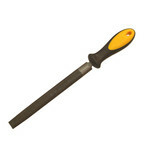 200mm (8”) file (blade length) with extra slim triangular blade for working in confined spaces, with Soft Grip handle. 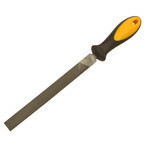 A versatile 200mm/8" half round wood rasp suitable for use various types of wood. 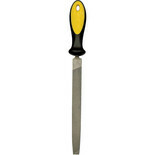 Featuring a high carbon steel blade that is double cut on both sides for quick and easily material removal. 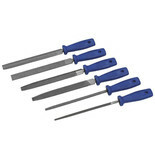 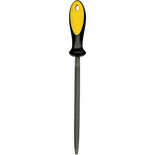 The Draper 8106B/8 File and Rasp Set has been manufacted with high carbon steel, hardened and tempered with soft grip handles incorporating hang hole.